Forests are a vital part of the Earth’s life-support system. They clean air and make oxygen, moderate temperature, and reduce wind and soil erosion. They’re incredible places to hike and unwind. To get the most from these benefits, Environment Canada recommends at least 40 per cent of the Credit River Watershed be forested. Currently, we have about 23 per cent forest cover. We’re hard at work though. CVC has been planting trees for more than 60 years with help from private landowners, volunteers, municipalities and neighbouring organizations. Together we’ve planted more than 6 million trees on more than 5,000 acres. Planting trees is one of the best ways you can help build a thriving community that’s resilient to the effects of a changing climate. 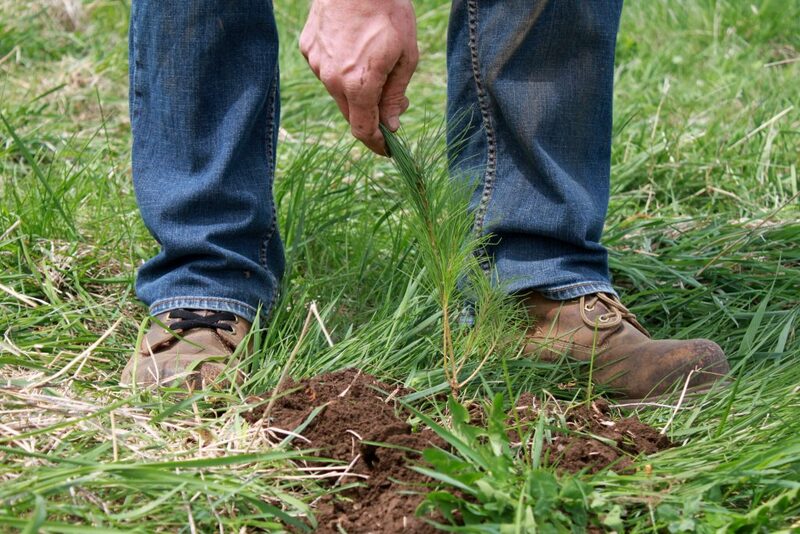 You can get involved in tree planting programs at home, at work and in your community. Landowners with at least two acres of land can participate in our subsidized private landowner tree planting programs. Our forestry experts do the work for you. We create a customized planting plan, deliver and plant trees. We also offer advice and forest management services to help you keep trees healthy as they grow into a beautiful forest. For more information or to book a free site visit, tree planting services. If you live in a home in the city, you can also help. Attend one of our Naturescaping workshops next spring or in the fall. Receive a free native tree or shrub to plant in your yard. Check our events calendar or sign up for The Garden Post to stay current . Greening Corporate Grounds (GCG) helps businesses, condos, schools, churches and others become sustainability leaders by implementing green landscaping practices on their properties. In 2018, GCG member Mitutoyo planted over 400 trees on its Mississauga property through our subsidized potted plants program. All GCG participants improve their communities and build sustainability from the ground up. Contact us to arrange your free consultation. Connect with your neighbours and give back to your community with our Community Tree Planting Programs. You’ll work alongside CVC and our partners to improve nature’s resiliency in your neighbourhood. Check our events calendar through spring and fall to join a planting day near you. More trees in the ground means more forest cover, more habitat, more species diversity, more shade. This ensures we enjoy all the benefits of forests. Learn more here. Here at Whole Village we have a rocky, somewhat wet(in places) field west of the wetland forest that we have planted some trees in – mostly edges. The field is not appropriate for crops, maybe not even pasture, so we need some advice about whether it would be good to continue tree planting to extend the forest/buffer. Could we make a date to walk this area some time this winter with someone who can assess the possibilities? Could Brian be available for this task? Hi Brenda! Feel free to fill out this form and someone will be in touch.